Free-Market Analysis: Oh, boy. China is dotted with ghost cities and crashing trains. The solution to China’s incredible boom and (eventual) almost incomprehensibly ruinous bust is … more foreign investment! The world is tapped out and thus the knick-knacks that the Chinese government has demanded its citizens build for Western populations are not selling so well. The flow of currency into China has slowed. Meanwhile, the idea that the Chinese themselves would purchase the flimsy products they sell abroad has gone a-glimmering. What to do? Well … how about relaxing currency controls? Allow foreign companies to pump more cash into China. Will Western corporations actually do so? Will they throw billions into the sink-hole that is modern China, with its murderous ChiCom system operating in the background and setting the real economic rules? But why is this necessary at all? In a word … power. Or rather, the necessity to continue to hold on to power. The ChiComs, in our view (and we’ve gone back and forth on this), are entirely on board with the Anglosphere plan to rule the world. Britain conquered China in the 1800s and nothing much has changed since – at the very top. The ChiComs have also fully adopted the Anglosphere power elite system of empire which relies on monetary stimulation for economic expansion. In this case, the expansion has been ongoing for about 30 years. It’s due for a breather. I will try to keep those of you who are interested in my progress as I go through the many ups and downs and hopefully the eventual success of this new start in life! Staying in Ireland as we start the coming year is a non starter as new taxes and austerity measures are hitting hard the ones who least can take the burden and at the same time shielding the vested interests in our country is only putting off an even bigger disaster heading our way! The maths do not add up and reality will force its way to the top soon enough! The lottery salary’s of our politicians, special advisors, insiders, and top heavy management of the country’s civil service is crippling our nation. Protecting these vested interests will have to be addressed .The Gombeen politicians are too corrupt and self-serving to be expected to do the job and I expect that the IMF and EU will have a step up to do the honours whilst the same politicians say they have no choice and no say in the matter .Meanwhile our health system our education system, the poor, the aged, and the unemployed will have to carry the heavy load and I ask myself, when will they stand up and say no more? we have had enough and things will get nasty ! We as a country must accept that the politicians have overestimated the load baring capacity of the country in forcing private bank debts on to the shoulders of the ordinary citizens of our country and thus have betrayed their duty of care of each citizen guaranteed under the constitution of our republic .Looking around the shops some people are doing nicely whilst others are struggling to put food on the table. On the other hand we have Champaign socialists like Proinsias De Rossa who has made a nice living claiming to be a champion of the working man and woman comes out and backs Mr. Kevin Cardiff for the Court of Auditors a job that will pay him 276,000 a year ! In 1906, Senator Nelson Aldrich – known as the “General Manager of the Nation” because of his impact on national politics and position on the Senate Finance Committee – sold his interest in the Rhode Island street railway system to the New York, New Haven and Hartford Railroad, whose president was J. P. Morgan’s loyal ally, Charles Sanger Mellen. By 1906 the annual rate of US capital formation was running at $5 billion. This rapid expansion went hand in hand with the creation of enormous industrial and financial monopolies. By 1904, more than 1,800 companies had been consolidated into 93 corporations, a financial consolidation led by J Pierpont Morgan. A few historians believe that J.P. Morgan published rumors that the Knickerbocker Trust Company (in the ten years up to 1907, trust companies had increased three and a half times, to $1.4bn, compared with state banks, which had doubled to $1.8bn. The Knickerbocker Trust was the third largest Trust in New York with $65mn in deposits and 18,000 depositors – Robert F Bruner and Sean D Carr, The panic of 1907) was insolvent, the widely spread rumors were followed by the *National Bank of Commerce announcing it would stop accepting checks for the Trust Company which triggered a run of depositors demanding their funds back – thus precipitating the Panic of 1907. The year of which the Maya’s said, it will bring the end of the world as we know it. And although I neither believe the Maya’s, nor Nostradamus, the Jehova’s witnesses or the position of the vermicelli in my soup bowl after eating, 2012 will be a decisive year. It will be the year that either decides whether we have a W-shaped recovery, or an L-shaped (L for Long) recession aka depression. And it will be a year in which we hope that the leaders will show their true leadership, strenght and wisdom, but in which we fear their selfishness, indecisiveness and stubbornness close to stupidity. Like many other newspapers and bloggers I will make an Outlook for 2012, based on a number of topics. Although such an outlook is the (non-)scientific form of ‘reading tealeaves’, it might help you to organize your own thoughts on the economy of the coming year. Today the first part of this outlook will be issued and tomorrow the second part. As this will be a bearish outlook in general, I hope to be wrong in most cases. But I’m afraid I will not be. As mentioned earlier, 2011 was not the year in which our leaders surprised us with their leadership, strenght and wisdom. This was the year of: everybody for themselves and God for us all in Europe and Democrats vs. Republicans (Civil War v1.1) in the US. To be honest: I’m not very hopeful that this behavior of EU and US politicians will change in 2012 and that the true leaders will stand-up. If the situation around the Euro and the PIIGS remains fairly stable and doesn’t become much more desperate at once, the European leaders will continue with only paying lip service to the European cause. They will go on with pleasing and serving their (more and more xenophobic and autistic) grassroots instead, while ignoring the European big picture. In that case the financial markets will continue firing warning shots and the Euro will remain under continuous pressure, without breaking really. Europe will run a substantial risk of getting into a situation of stagnation and a long period of minimal growth that might last for ten years or even longer (the Japan scenario). As we speak, President Barack Obama is busy with trying to lift the debt ceiling in the United States, as he did before on a number of occasions in 2011. And every time this led to a brawl between the Democrats and the Republicans, as both parties tried to get their portion of pork in the emergency laws that were necessary to fix the debt ceiling. By the way, until now the Democrats have been less succesful in saving the social security system than the Republicans have been in saving their tax cuts for the richest 1% of the American population. This is a bad omen for American leadership, I guess. A great article and well thought out and presented I am afraid I am not so optimistic on the economic outcome for Ireland and My second home Germany. I believe the contraction of the economies of the PIGS states will have a negative effect on the German economy. This is already showing as the German economy is set to contract again by year’s end .The economic forecasts for Irelands “growth” has been halved for next year and I believe that it will prove to be a year of contraction of about -1.5%-2.5%.The heavy burden of stealth taxes and incompetence of our politicians eager to serve the banker-dictatorship is going to destroy any hope of a recovery in the domestic property market and our skilled workers are heading out of Ireland before all their savings are swallowed up in just trying to pay their living expenses. The cost of living here in Ireland is outrageous high and we must expect that this cost will have to be drastically cut to come anyway near the average European level. Example I am paying for a one bedroom flat in the town I am living 400 Euros including heating and management fees. The same flat here in Ireland (across the road) a southside D4 similar place would cost at least 750.-900 Euros including management fees. Now for something cheerful and good and up-lifting ! Before I volunteered as a Kiva Fellow in Sierra Leone (May of 2011) and Bolivia (September 2011), I was living in Santa Barbara, California. Imagine: Santa Barbara beaches saturated with color, mansions with the smell of jasmine twisting through the air, and a pace of life only to be set by the sun. While there, I was working for a de jure artist and took up the ranks as a de facto artist myself. 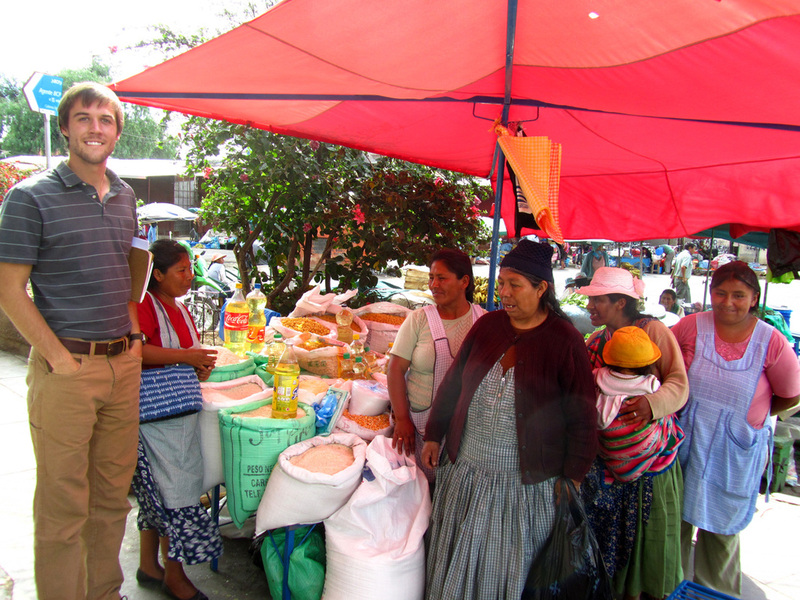 Life was pretty easy, and moving to a developing country and working with microfinance seemed a million miles away. Leaving it all made me wonder why I would forfeit the comfort and normalcy of home for places where it feels like I have to relearn basic parts of life (i.e. restroom, showers, and food). While volunteering, I was often asked , “Why would you come volunteer in my country?” Each time, I rambled about a desire to foster opportunities in the development of people around the world. But that is just it, how concise can pre-volunteers really be? Well, the life of a volunteer goes with the wind. Four weeks ago I was living in Sierra Leone and today I am sitting in an office in Bolivia. Obviously, volunteering is not the most advantageous financial move one can make; in fact, while in the States, I qualified for free immunizations before coming to Bolivia because I was “low income”. In all honesty, most volunteers are a footnote to an organization’s real employees, and the “We couldn’t do it without you” speech only gets volunteers high for a split second. So why endure the bucket showers in Sierra Leone and language barriers in South America? Why volunteer? For me, it has to do with something I encountered as a child while hiking around my home in Washington State. I saw the diverse beauty of nature: cedars, Douglas firs, ferns, and myriad wildflowers. I then thought about the diverse beauty of humanity (although those weren’t my exact thoughts as a child…). What it came down to was that I knew people (and the world) had to be different beyond my hometown population of ninety-something. I didn’t leave and volunteer to “save the world.” (Do people still do that?) Rather, I had this desire to cease to be dichotomized from the developing world. Volunteering was a means to share life with people and hope to understand why populations live at different standards of living. This, hopefully, is joining in the process of lifting people out of poverty –the more minds and hearts that are included in the “process” (any process or cause you are volunteering for), the more potential there is to yield results and answers. Loan to Virgen Del Rosario Piribebuy Group in Paraguay. Thank you for making your 5th Kiva Loan and making a donation to Kiva! We’re so excited that you’ve chosen to give a hand up to entrepreneurs working towards better lives. Donation to Kiva’s Operating Costs: $2.50 Your donation has been matched through the generous support of Omidyar Network. Kiva is a 501(c)(3) charitable organization. No goods or services were provided to you by Kiva in exchange for your donation. This donation may be claimed for a deduction from your U.S. taxes. Please consult with your tax counsel regarding the deductibility rules that apply to your specific tax situation. Euro-zone Credit Implosion Secret, ECB Cannot Stop Collateral Contagion Collapse! How long can the European media keep the EU credit implosion a secret? The disgraced former IMF Director, Demonic Strauss Kahn said on Tuesday December 12th, 2011 that No ‘Firewall’ Exists and Europe Has ‘Only Weeks’. Of course within minutes of this Financial Times news release which detailed his vent on EU leadership and the perilous situation in Europe, the article disappeared. The details of the European liquidity crisis are generally reported, but for some reason no media source wants to pull the pieces together so everyone can see the magnitude and futility of the crisis. A growing Collateral Contagion is being shrouded in the apparent belief that the solution to the European Financial and Banking crisis is a grand change in Treaty governance. Obviously the European Central Bank (ECB) was well aware of the reality, when it was forced to deploy a historic and unprecedented LTRO (Long Term Purchase Operations) on Wednesday December 21, 2011. 560 banks desperately and immediately grabbed what they could, to the tune of €489B. The LTRO bought the EU private banks some time. It did nothing to solve the EU Sovereign Debt Crisis. After less than one week, the cash held at the ECB surged €133B to a new record €347B. Since the net LTRO was only €210B, it tells you that the EU banks not only have a cash problem, but more specifically, as ECB President Mario Draghi says: “hoarding at the ECB signals that the problem afflicting the Eurozone is not so much about the amount of liquidity but that this liquidity is not circulating around the region’s banks”.